This page includes Free Violin Scores to several easy and well known pieces. It includes graded violin music from beginners to more advanced players. The concepts and techniques are learned very progressively and are introduced by theory boxes and exercises. The pieces become progressively bigger and harder and are ordered by key signature and hand position. The violin scores are well known classical themes from famous composers, popular folk tunes from several countries and pieces by the author. Several scales and arpeggios are included. Playing scales and arpeggios is essential to master the different positions, different key signatures and achieve a good intonation. The pieces start in D Major. he keys of G Major, C Major and F Major are introduced later. Feel free to download and print these free violin scores and exercises. You can also listen to the pieces. 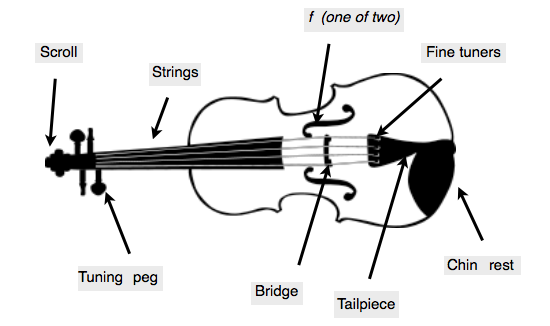 Now you will learn a little about the parts of the violin. The fingerboard is the black piece of wood where you put the fingers of your left hand. The four strings are over the fingerboard. The bridge is the piece of wood that holds the strings after the fingerboard. The violin has four strings. The first (I) is the A string, the second (II) is the D string, the third (III) is the G string and the fourth (IV) is the C string. They are numbered from the highest pitched string (I) to the lowest pitched string (IV). The scroll looks like a head at the top of the violin. The two f holes are in fact holes shaped like an f. They are located on the left and right sides of the bridge. The tip is the narrow point of the bow, opposite to where you put your hand. The frog is the part of the bow opposite the tip. You’ll find it near the point where you place your right hand on the bow. The stick is the wooden part of the bow. It is made of Pernambuco tree wood. Bows are also made of other materials, such as carbon-fibre (which is stronger than wood) and fiberglass (often used to make less expensive bows). 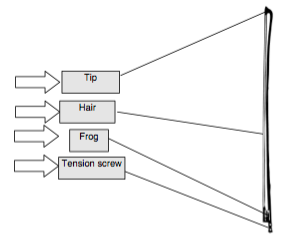 The adjusting screw is located near the frog and you use it to tighten or loosen the hair of the bow. The hair is the part of the bow that touches the strings. Bows need to be re-haired periodically. It’s not a part of the bow, but you use it on the bow. Rosin is sticky. You rub it on the hair of the bow before you play. It causes friction so sound comes from the strings when you play with the bow over them. Now we explain some violin techniques and symbols you will see in music scores. Pizzicato playing is using your fingers to pluck the strings, instead of using a bow. The word pizz. tells you to play pizzicato when it appears above the note. On the other hand, when you see the word arco, you play with your bow again. For this reason, you play pizzicato all the time until the word arco appears. Stand or sit with a straight back. You’ll have more freedom to move if you stand up, so practice playing the violin while standing up. Look forward (and not down). Lean your head slightly to the left, so you can hold the violin and rest your jaw on the chin rest. Don´t lift your shoulders! When you use the bow, you have to tighten the hairs first. Then you rub the hairs with rosin. After you play, you have to loosen the hairs of the bow. When you see the slur between the notes, you play the notes in one bow. The key signature appears in the beginning of the score, after the clef. It tells you which notes will be sharp or flat throughout the music. The Sharp before the note means that you have to raise the note’s pitch (a half step, or semitone). Learn with our free graded violin scores. They include tutorials, video and downloadable pdfs and ebooks. Keep checking this page for new free music scores.